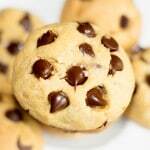 Believe it or not, until recently I had only baked chocolate chip cookies a handful of times. I generally settled for dry, crunchy store-bought cookies that provided, at best, a mildly pleasant satiety. Not too long ago, I was walking around a supermarket (as one does), and I saw a big pack of chocolate chip cookies on display. They were calling out to me. RIZ….RIZZZZ….EAT ME. ALL OF ME. I won’t lie. I was tempted. And I nearly gave in, until a little voice in my head whispered that every food blog needs a chocolate chip cookie recipe, especially one called Chocolates & Chai! I went straight home and got to work – reading. 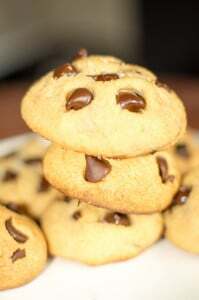 That’s right, I scoured Google for chocolate chip cookie recipes and guides. 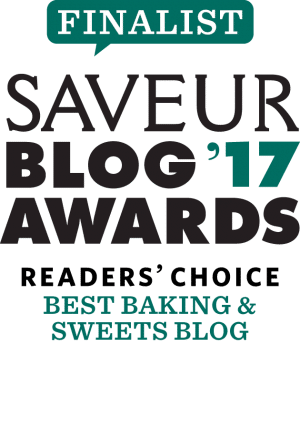 It would take forever to list all the websites I visited, but should you want to learn about the variables of baking chocolate chip cookies, I highly recommend this article, and this one too. Be warned, should you click either link – there’s plenty of reading ahead! 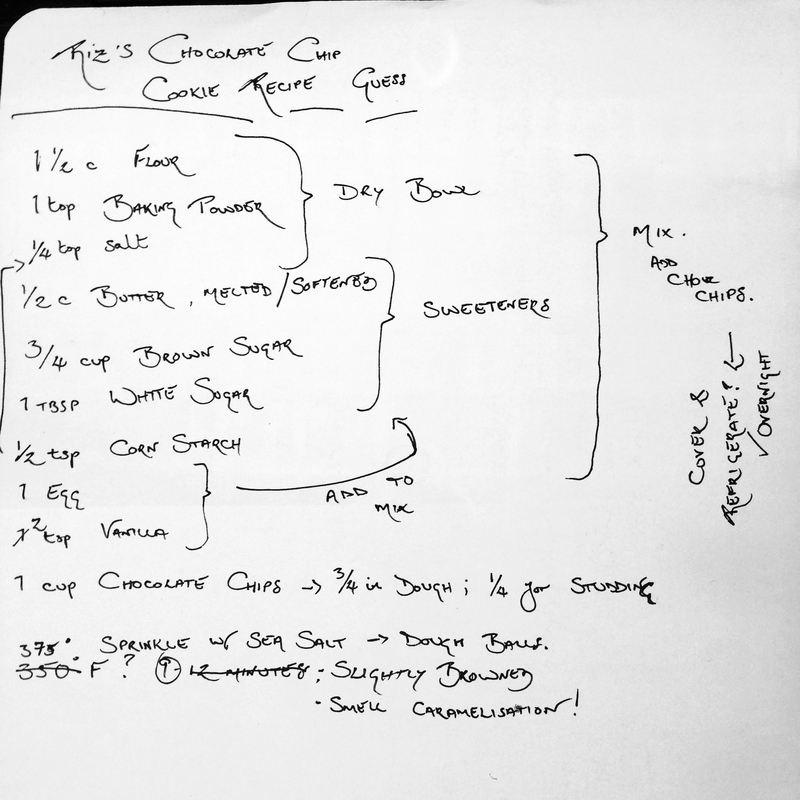 Based on my readings, I scribbled down a recipe and set forth into the kitchen! It’s rare that a recipe comes together so quickly, but two experimental batches later and I felt confident I had it. Just to be safe, I baked a batch for a friend to try out. She had me prepare another batch immediately with the proviso that they wouldn’t be touched. Why? Sorry about my messy handwriting! Literally, scribble. Sift the flour, baking powder, table salt, and corn starch together into a bowl. Set aside. Mix the softened butter with the brown and white sugar. Add the beaten egg and vanilla extract. Stir until completely incorporated. Add the wet ingredients to the bowl with the flour mixture. Stir well, until the flour mixture is completely incorporated. 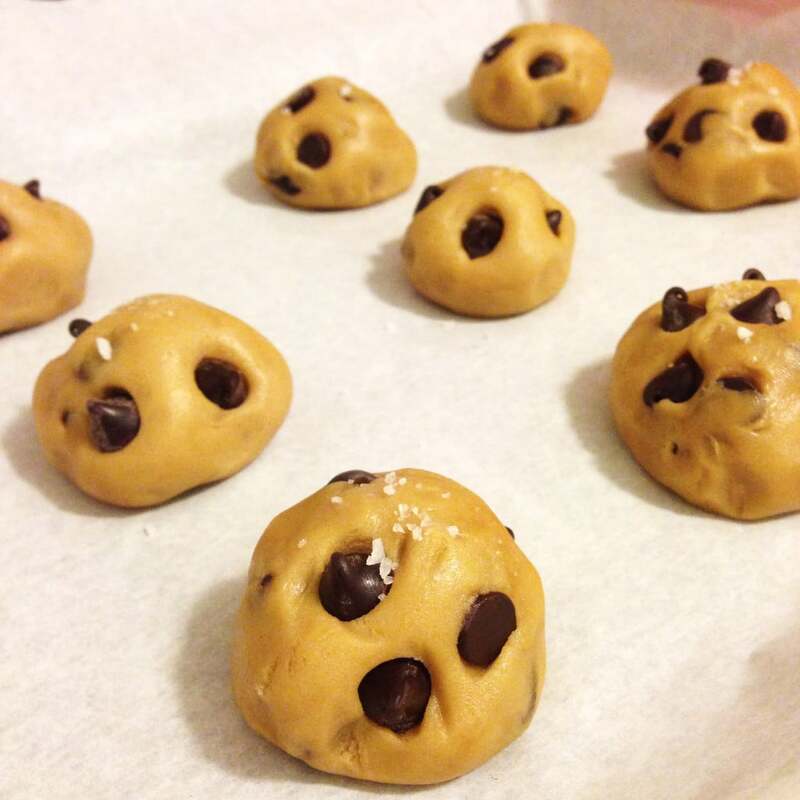 Gently fold ¾ cup of chocolate chips into the dough. Spoon the dough into your hands, and form little balls of dough – approximately the size of a golf ball. If you’re feeling lazy, you can just spoon the dough on to the baking sheet, but rolling them into little balls results in lovely round cookies! Though, if you want your cookies to spread a little more (so you’ll get a bigger, slightly thinner cookie), flatten the dough ball just slightly. Stud the top of the dough balls with a few chocolate chips, purely an aesthetic addition. 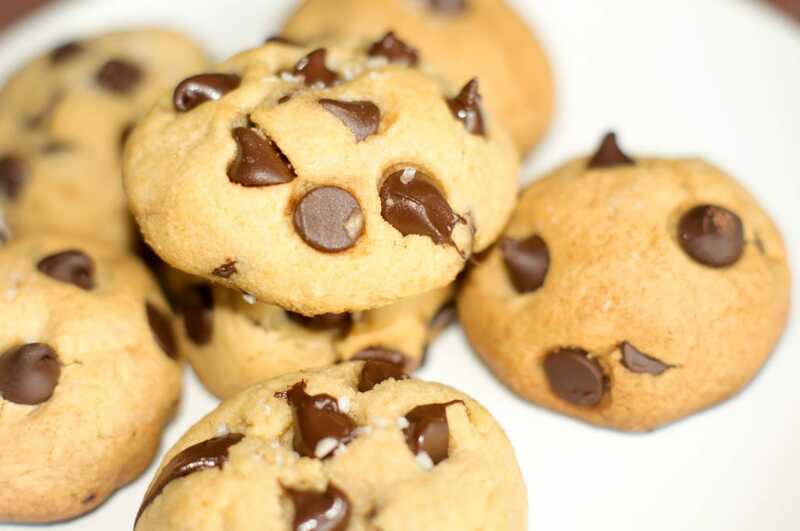 But who doesn’t like seeing chocolate chips on their chocolate chip cookies? Besides, more chocolate is always a good thing! Sprinkle a teeny amount of sea salt on each dough ball. Okay, by now some of you know that I’m a sucker for sea salt. And yes, this is purely a matter of taste… but don’t skip this step! Just like the dark of night introduces us to the bright of day, the sea salt provides a contrast to the sweet chocolate chip cookies, enhancing that already amazing flavour. Place on parchment paper or a greased baking sheet, and bake at 375 degrees F for 9 minutes when the cookies are slightly browned, or until you smell caramelisation. Remove the cookies from the oven; set aside on a wire rack to cool. The cookies will be soft when you take them out but will continue to cook on the wire rack as they cool. As it happens, while I’ve been typing out this post. My taste-tester gave me a call to let me know that she’s planning on baking the cookies for her friends this weekend at a brunch. That’s a good sign! You should give it a try too, and comment below and let me know what you think. 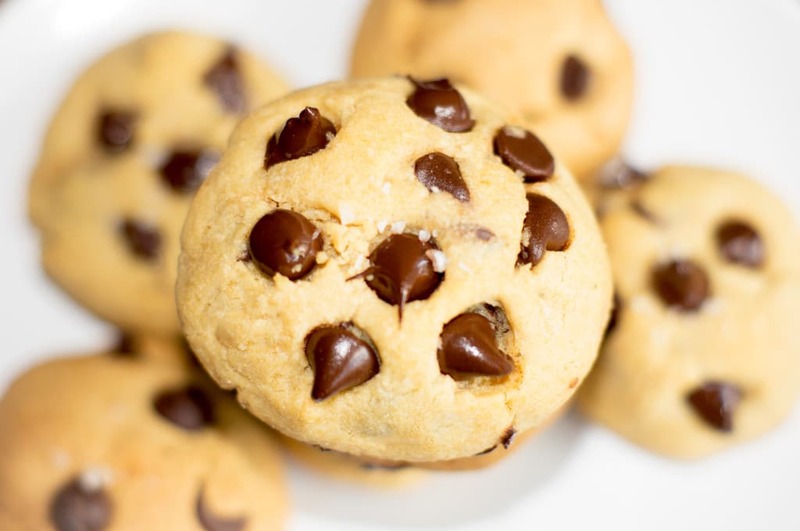 Spoon the dough into your hands, and form little balls of dough – if you want your cookies to spread a little more flatten the dough ball slightly. Stud the top of the dough balls with a few chocolate chips. Sprinkle a small amount of sea salt on each dough ball. Remove cookies from the oven; set aside on a wire rack to cool. The cookies will be soft when you take them out but will continue to cook on the wire rack as they cool. should we used unsalted butter or regular? Thanks!